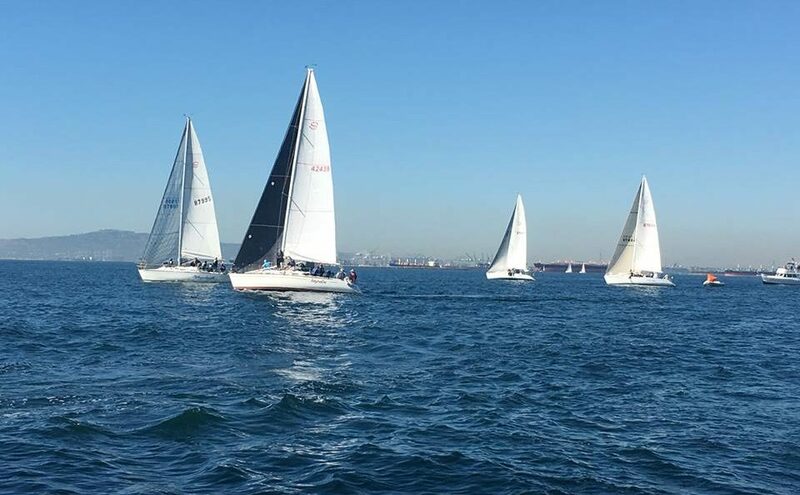 This past weekend saw the warm and sunny blue skies of a California winter as six Schock 35’s took to the waters of Long Beach for the SCYA Midwinters Regatta. Boats came down from Cabrillo Beach and as far north as Santa Barbara to sail in this annual, two-day event. The fleet has been experiencing a renaissance in the last few years and this is their 3rd consecutive year receiving a start as a one-design class. Light and shifty winds challenged the fleet on Saturday. Tacticians sought to keep the team on the right side of the shifts and helmsmen worked hard to keep the boats moving at good numbers. Positions in the fleet would change every leg, making for exciting crossings with each tack. In conditions like this, a single bad tack or gybe could snowball into the loss of several boat lengths, forcing crews to sail as flawlessly as possible. As sailors returned to the docks after the first three races, local legend Bob Marcus and his team on “Code Blue” sat atop the podium with John Rossbauch and Ted Thompson’s “Whiplash” tied for second with Baz Darcy’s “Bully” and just a couple of points behind them was the Santa Barbara team “Uncle Bob” owned and skippered by Larry Leveille. While the racing was fierce on the water, bitter rivals became best of mates back at the bar where teams traded tips and settings in pursuit of squeaking every knot of speed out of their boats. Weather became more like “Long Beach winds” on the second day as teams began the day with 8 knot winds, building to 15 knots throughout the day. Sailors had their work cut out for them in the freshening breeze, which tested trimmers to keep the large sailplan in balance. Long Beach Yacht Club’s race committee lived up to it’s reputation of keeping a well-managed grand prix course on the water and provided world-class hospitality afterwards. 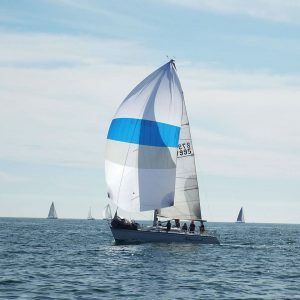 “Code Blue” set the pace, unveiling their new Ullman FiberPath+ Heavy #1 Genoa, which proved to be quite a weapon in the weather legs, securing their victory for the regatta. 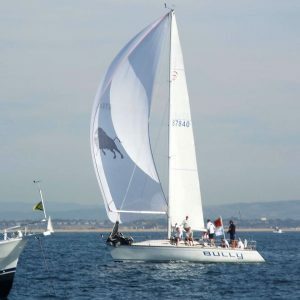 “Whiplash” continued to sail consistently to claim second place and “Bully,” a team from Cabrillo Beach, took third to round out the podium. Great job to all skippers and crews. 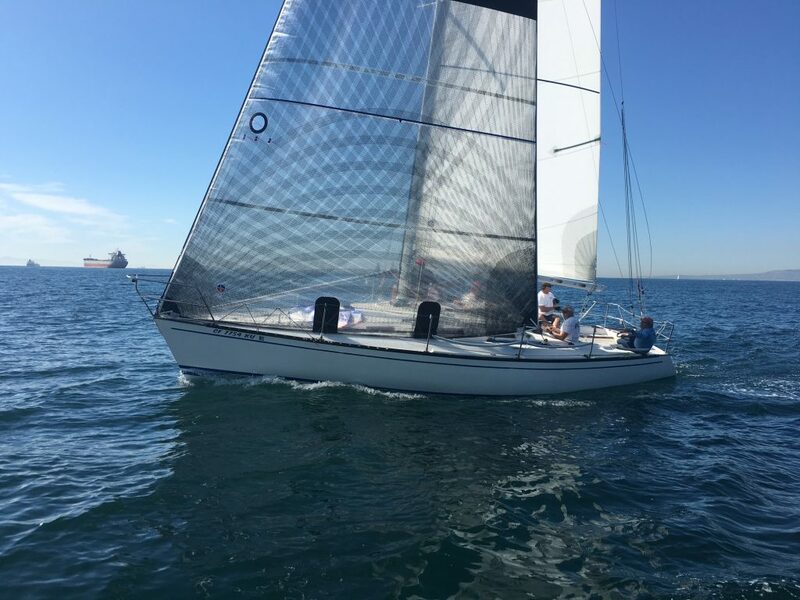 The Schock 35 Class is continuing to grow and will be back in action with eight boats for Yachting Cup in San Diego in May.